I was helping a teacher this morning who was using google drive with her students. The goal was to get the students to upload photos of their artwork to a folder in Google drive so that everybody could have access. The students would then choose one of her peers’ images, download it to her iPad and comment on it, then upload the feedback to the folder. During this process, we were wondering if it wouldn’t be simpler for students to create a google doc, paste the image in it and then add it back to the folder. That way they wouldn’t really have to leave the app. Those features that you see are pretty much all you get. No hyperlinking, no adding images. No fancy formatting. 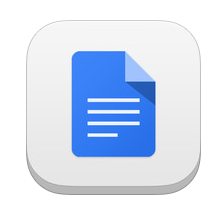 Still, if you want to create a google doc on your iPad, you will now have to download the new app. Maybe they are planning on making it better? Maybe more features are on their way? I am going to err on the side of optimism here and give them the benefit of the doubt. Just in case you finally got used to the lay out of Google Drive, Google is switching it up again. 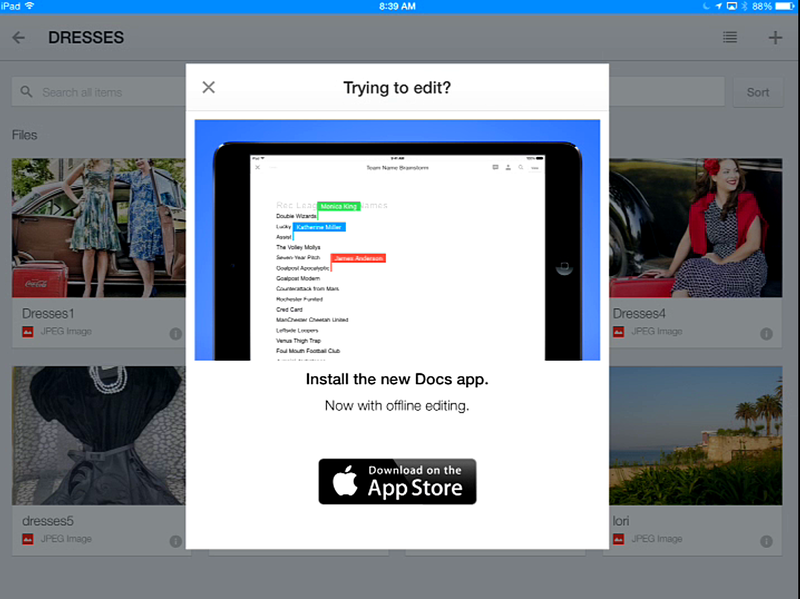 They now have separate apps for your documents and your spreadsheets. Apparently a google slides (which I assume is their presentation software) is on its way. One other note: at the time of the writing of this, I checked the app store to find these apps and was not successful. However I hadn’t installed the last update yet (it is going right now) and the link in the article works and will bring you to the app in the iTunes store. 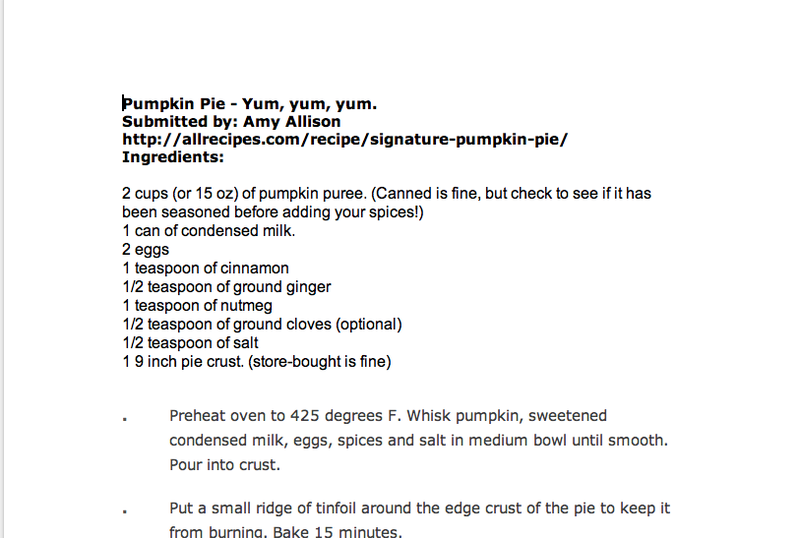 To make up for last week’s April Fool’s, here is a real article about all the amazing things you can do with Google docs via Mary-Kate. I for one, will be referring back to it for a while- after a cursory glance, I am intrigued by the ability to embed presentations as well as use Polyline for drawing. In my inbox this morning was a query from the history teacher to our intrepid IT committee wondering why, when she uploaded her Google doc to share with her students who were supposed to edit it, were they not able to? Have you had this happen before? I have. I never really looked into it, just assumed that Google doc was a tad xenophobic of other formats. My way around it was to simply copy and past my text into a new google doc. However. Apparently there was a step I was missing when uploading my file. Thanks you Dan the Man for sending the instructions! Alas, I am afraid that my efforts today did not bear any fruit. 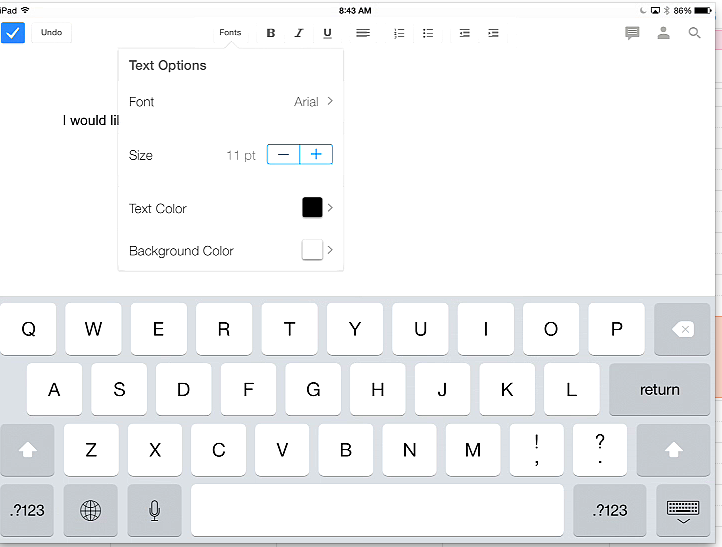 I was curious to see if google docs worked on the iPad as I am cheap and want a free solution to word processing. Yet however much I tried I couldn’t get it to work. Oh, I could get into google docs and could even see my list of documents, but every time I tried to open one it would bring me right back to the index. There seemed to be an option to create a document or a spreadsheet, but the same thing happened when I clicked it: that is, absolutely nothing. I am thinking there’s a glitch in the system? I’ll try later this week, as all the articles I’ve read seem to think it is possible. Have you tried to edit a google doc? If so, were you successful? help me out here! I even tried to get an article from a Canadian source, just in case the update hadn’t reached Canada (I know, I know- grasping at straws).